Sanctuary 2015. Noon 26th- Noon 27th September. Murrays Monument, Galloway Forest Dark Skies Park, A712, Nr Newton Stewart. DG8 7BL. A 24 hour public art laboratory experimenting with new ways of using technology to explore darkness, light and place. The Galloway Forest Dark Skies Park is a place within which darkness is protected. 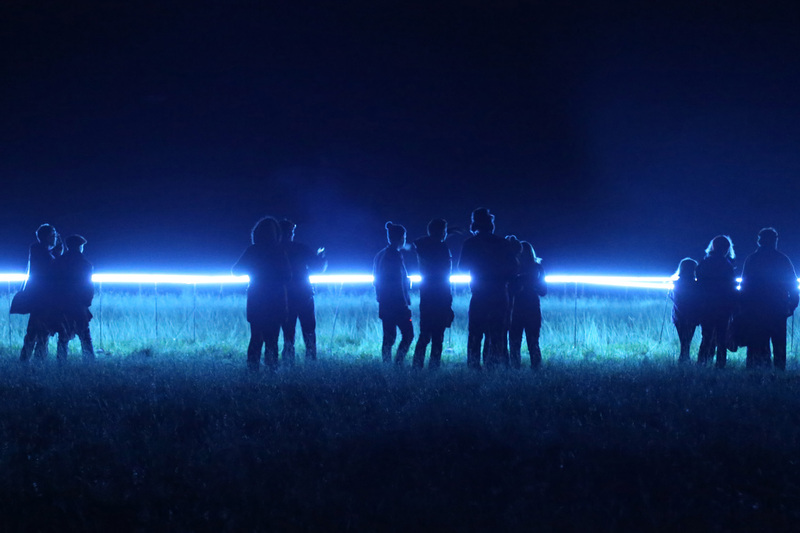 Within this remote Park, access to communication networks is limited and at Sanctuary we have extended the notion of darkness to include electronic or digital darkness and created an event that provokes responses to the all-pervading nature of communication technology and electric light. This remote place can be considered a Sanctuary from both light pollution and worldwide connectedness. A temporary escape into digital darkness where we can explore our relationship with all kinds of technology, take control and use it in experimental and creative ways, or disengage with it entirely and create new behaviours, liberated by the knowledge that no-one is looking. Sanctuary has become a place for new ways of experiencing, exploring and connecting with landscape and place. How can we read the landscape viscerally, visually and conceptually? How do we experience the world through the lens of technological devices and how do they mediate our experiences? Sanctuary is not rejecting the digital age – there are artists creating digital artworks and networks on site – rather it aims to interrogate the meaning, uses and implications of technology and the ownership and agency of the devices and networks that now connect us. And in the realm of dark and light, in this, the International Year of Light, there are experimental artworks that both examine and play with light and its significance across the visible and also the non-visible spectrum. Sanctuary creates a new public space – one that is created by its participants (both artists and visitors). It is place where new conversations can happen and experiments conducted. This is exemplified by The Dark Outside FM, an annual site specific radio broadcast of previously unheard sound, that has gradually gathered the Sanctuary public laboratory around it. It exists temporarily as a deep part of the environment, then disappears without a trace, deleting its content as it goes. Murmurate (Tim Shaw and Sebastien Piquemall) Incorporating synthesised sounds and field recordings from the immediate surroundings to be processed, organised and performed through a local network of the audiences mobile devices. Nightlight-2 (Unicorn Diagram) a shadow catcher, capturing a multitude of brief moments in time. Eternal Silence (Jamie Clements and Nick Millar) using morse code to beam final messages to the universe in a maximum of 140 characters. These works and the many more at Sanctuary, involve the audience in investigations of both where we are and who we are. It is part of an ongoing creative exploration of place and environment, a space for new work and conversations, new concepts and synergies. This entry was posted on September 25, 2015 at 8:30 am and is filed under News. You can follow any responses to this entry through the RSS 2.0 feed. You can leave a response, or trackback from your own site.